Organize and protect your downhill and cross-country skis and poles with this convenient storage rack. It keeps ski and pole sets together but separated to prevent them damaging each other. It also protects walls from damage caused by skis leaning up against the wall. In addition, the wall mount creates a highly convenient storage location - your skis can be off the floor to reduce tripping risk and increase floor space, near the door or car for easy transportation, and not liable to fall down and cause damage to themselves or other possessions. Mounting hardware included with your purchase. This is a great product but the company needs to stay abreast of what is happening with skis. Many now have a plate under the bindings that makes the spacing on this product not far enough apart. They need to add an inch at least for this to be perfect. Also there was no glue used to secure the dowels that were for the poles. I had to do that myself. Disregard the three star review written by the other customer reviewing this product. 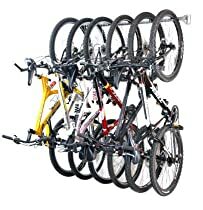 This is a great rack at a great price. I'm not sure what the other customer is complaining about. Spacing is appropriate for modern skis, and I did not have to wood glue any pegs. Even if I needed to use a little glue, it wouldn't have been a big deal considering the great price. Thanks to Woodform for saving me a couple (or more) hours of my own time putting together a homemade rack. Shipped very quickly. Holds 4 pairs of adult skis. No room for the poles to hang between the skis, but two pairs of poles can hang from one peg. Have had it for 4 months now with no weakening or indication of impending failure.